Add strength and moisture to dry, damaged hair and condition while you shower with Hollywood Beauty Carrot Cholesterol. This deep conditioning creme adds strength and moisture to dry, damaged hair. 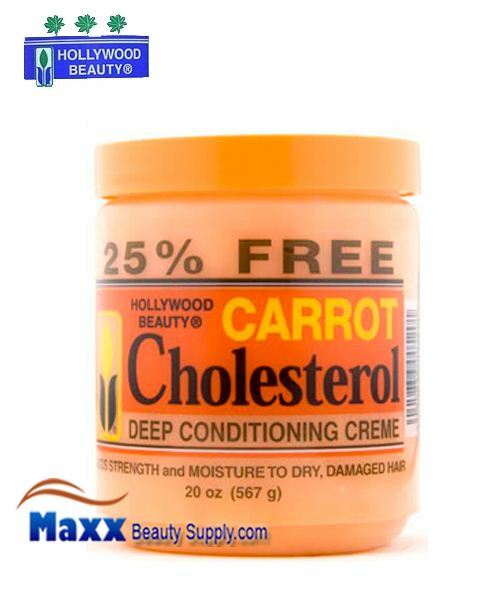 For quick conditioning while in the shower you can shampoo and rinse hair, then apply a generous amount of Carrot Cholesterol to hair and scalp. Leave on for two minutes and rinse hair thoroughly. Deionized Water (Aqua), Cetearyl Alcohol, PEG-40 Hydrogenated Castor Oil, Stearalkonium Chloride, Cetyl Alcohol, Stearyl Alcohol, Carrot Oil, Propylene Glycol, Glycerin, Mineral Oil, Tea Tree Oil, Jojoba Oil, Avocado Oil, Coconut Oil, Egg Protein, Cholesterol, Aloe Vera Extract, Calendula Extract, Lemon Extract, Rose Mary Extract, Great Burdock Extract, Ivy Extract, Pine Extract, Sage Extract, Watercress Extract, Chamomile Extract, White Nettle Extract, Capucine Extract, Fragrance, Methyl Paraben, Propyl Paraben, Diazolidinyl Urea, DMDM Hydantoin, Disodium EDTA, D & C Yellow 10, FD & C Yellow 5, FD & C Yellow 6, FD & C Red 4.